adjective 1. top quality: generally considered to be of the highest quality or lasting value, especially in the arts 2. definitive: authoritative and perfect as a standard of its kind a classic example of a mixed metaphor 3. always fashionable: always fashionable and elegant, usually because of simplicity and restraint in style the classic “little black dress” 4. generally accepted: conforming to generally accepted principles or methods 5. extremely and usually comically apropos: apropos to an extreme degree, usually with a comical or ironic twist (informal) It was classic – the way she tripped while she was telling us all to be careful! noun (plural clas·sics) 1. work of highest quality: something created or made, especially a work of art, music, or literature, that is generally considered to be of the highest quality and of enduring value The novel has become a 20th-century classic. a design classic 2. simple elegant garment: a piece of clothing of a simple and enduring style 3. outstanding or typical example: something that is an outstanding or typical example of its kind Last night’s show was a classic. 4. major sporting event: a major sporting event, e.g. a horserace or golf tournament 5. something comically apropos: something that is comically or ironically apropos (informal) classic or classical? 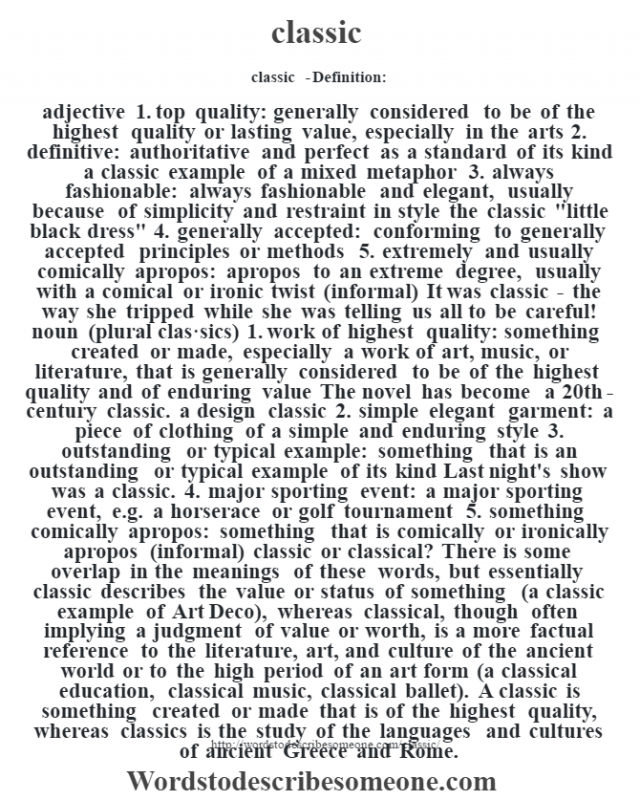 There is some overlap in the meanings of these words, but essentially classic describes the value or status of something (a classic example of Art Deco), whereas classical, though often implying a judgment of value or worth, is a more factual reference to the literature, art, and culture of the ancient world or to the high period of an art form (a classical education, classical music, classical ballet). A classic is something created or made that is of the highest quality, whereas classics is the study of the languages and cultures of ancient Greece and Rome.